The comfort zone is not where high performers live. They seek that EDGE, facilitated by necessity. They push for something greater in order to serve at the highest levels. This is a MUST WATCH episode about WHY you should leave your comfort zone and how to use necessity as a tool to finally make that change! Take your growth to a whole new level! Download and complete the worksheet for this training. Will this be a courageous year for you? The comfort zone is not where High Performers live. This is where people who ultimately become very dissatisfied with life live. Now, it doesn’t mean that you can’t be comfortable in your life. There’s nothing wrong with being comfortable at some point in your life. As you know—if you’ve studied my work—sometimes comfort over a period of time becomes boring or dissatisfied. And you feel like there’s something missing, and what’s missing is what we call The Charge. There is this other level of energy and engagement and enthusiasm with life. I’ve seen this when I worked with high level athletes. It happens with the Fortune 50 executives I work with. It happens with the celebrities I work with. People do not plateau because they’re not smart or not driven. It’s not because they’re sabotaging themselves, and it’s not because they’re in a bad mood. It’s not because of the kids, it’s not because of the team. At some point when we hit that plateau, there’s usually a reason why, and that is: we started guiding our days and thinking about our ambitions from our comfort zone. Our comfort zone is really a line of preferences. That’s it. Absolutely, enjoy the view, love the view! Set up camp on top of the mountains, shout out from the rooftops, have children, start a farm, start making your vegetables, live up there in comfort as long as you want! It’s just the human ambition for growth, for contribution, for deeper levels of connection and giving that drives so many of us. I love to look at your career, your relationships, your health and suggest to you that the way out of the comfort zone is not what you might think. Most people think that the way out of the comfort zone is to set a goal. They think it’s to have an aspiration. A lot of people think it’s hope. What a lot of people do is start breaking their comfort zone a little bit, dabbling, trying, taking one tepid step forward and then falling back. Here’s what I’ve learned about High Performers though. This was a big breakthrough recently when I was working with a very, very high level world-class coach for sports teams. 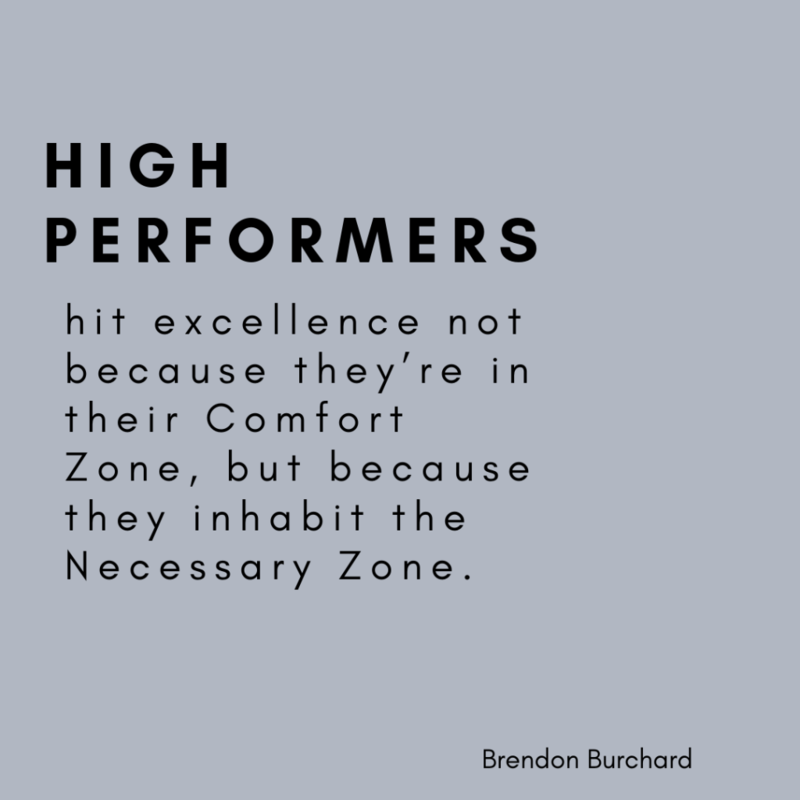 I believe the reason that High Performers hit excellence isn’t because they’re in their comfort zone, but because they’re in the Necessary Zone. I think it’s important for all of us to find ‘necessity’ if we are going to amplify our lives to the next level. If you’re in your comfort zone, you’re doing things because it’s easy. It’s a preference. You became good at what you do—it’s a skill, it’s a knowledge, it’s a core competency. It’s a capability you have, and you feel good about yourself. 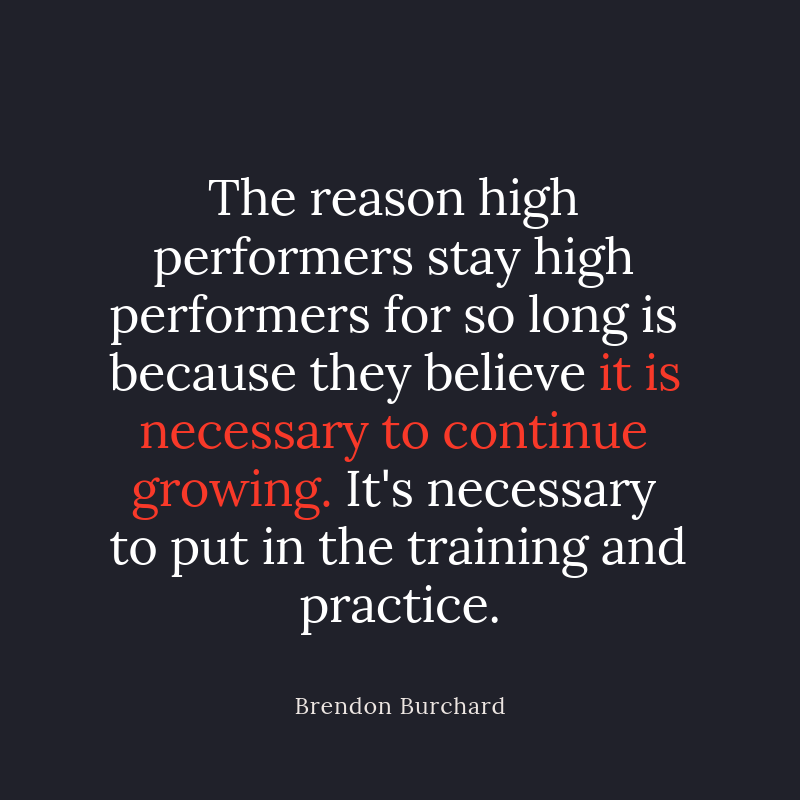 The reason High Performers stay High Performers for so long is because they believe it is necessary to continue growing. It’s necessary to put in the training and practice. It’s necessary for them to give more, to serve more, to contribute more. It’s necessary for them to grow in their character. It’s necessary for them to deepen their relationships. It’s necessary for them to feel more alive. It’s part of their identity that it is necessary to grow. It’s not like a hope, or an idea, or even an aspiration. It’s a must. It’s a necessity in their day to be great, to go that next level. I was talking recently to two NFL players. As we’re talking, one guy I was talking about, his hunger for being on the field. He said that the main difference between what he felt like he did and other people did, is he felt it was necessary for him to keep an edge. He didn’t push himself so hard because he’s afraid of people replacing him. He pushed himself because he wanted to grow. He also knew he was a role model. 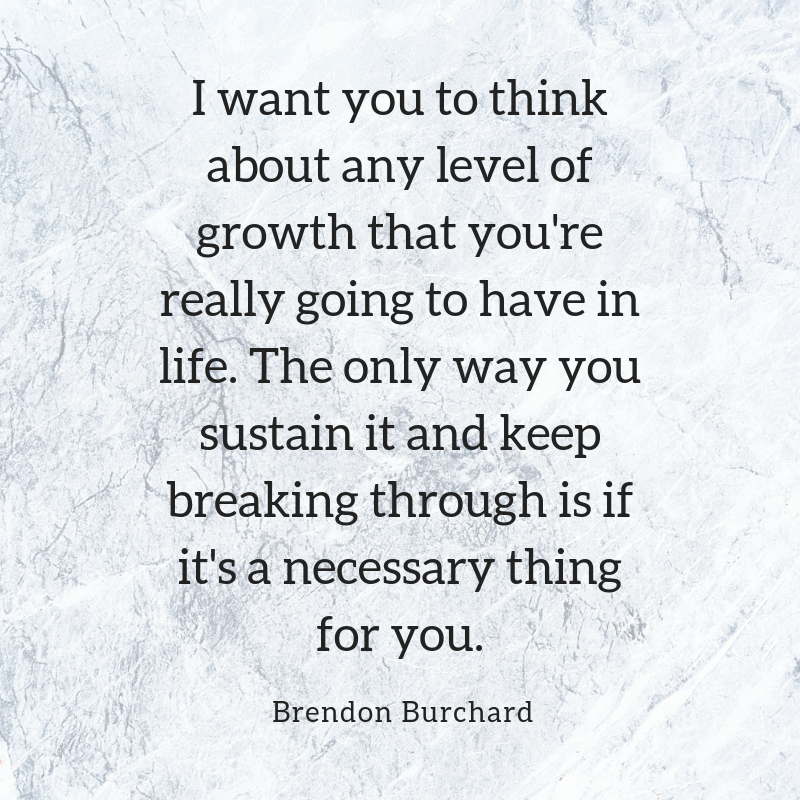 I want you to think about any level of growth that you’re really going to have in life. They only way you sustain it and keep breaking through is if it’s a necessary thing for you. Look at how many people start a great New Year’s resolution. It’s an interest. They step outside their comfort zone. They go to the gym, one, two, three times. They take those first baby steps. But, they don’t stick to it because it wasn’t real for them. It wasn’t necessary to become healthy. A lot of people become the most healthy in their life after surviving something. They broke their leg, got sick, saw somebody die, and realized they had to change. It became real for them. So I would like you to look at your life in three areas and find your necessary. Think about first your relationships. Why is it necessary for you to improve that relationship right now? Most people wait too late in their life to find their necessity. Now all of a sudden the necessity to get better is there. You may have waited too long to find your necessity, so you never got better in that relationship. People wait until tragedy, until scarcity, until obligation, until that very last moment to change, because it’s so much easier to be comfortable than to try. So first I’d like you to think of your relationships. What relationship in your life do you need to find your necessary in? It’s necessary for you to be a better dad, because why? It’s necessary for you to be a better wife, because why? It’s necessary for you to be a better team leader, because why? From everything we’ve studied in psychology, if you never asked that question and you’re not clear about why it’s important to you, you lose motivation. There’s no reason, there’s no drive, there’s no ambition and expectancy that we’re going to reach it. There’s no motivation. So in your relationship, what’s necessary? Now think about your career. Why is it necessary for you to be excellent at what you do? Why? Can you articulate it? Can you journal on it today? Think about your health. Why is it necessary for this year to be the year you get healthier? Why is it this year? Right now you’re going to quit smoking. Why is it this year you’re going to stop drinking all your calories? Why is it this year you’re going to stop overeating? Why is it necessary? If you’re just going to fall back in your comfort zone, you’re just going to keep smoking, keep drinking the calories, keep overeating. You’re going to stop working out because it’s easier. This is the path that feels so good. It’s the path of least resistance. But it also leads to early death. It also leads to relationships that are unfulfilling. It also leads to careers that are minimal and never scaled to their appropriate level because no one knew what was necessary. I work harder than I need to. It could be easy, I could live everyday not challenging myself. But, I wouldn’t be fulfilled. I wouldn’t fulfill my destiny. I wouldn’t fulfill my potential. I wouldn’t be here with you all. Because for me, it’s necessary to work harder. I focus, I develop, I practice. 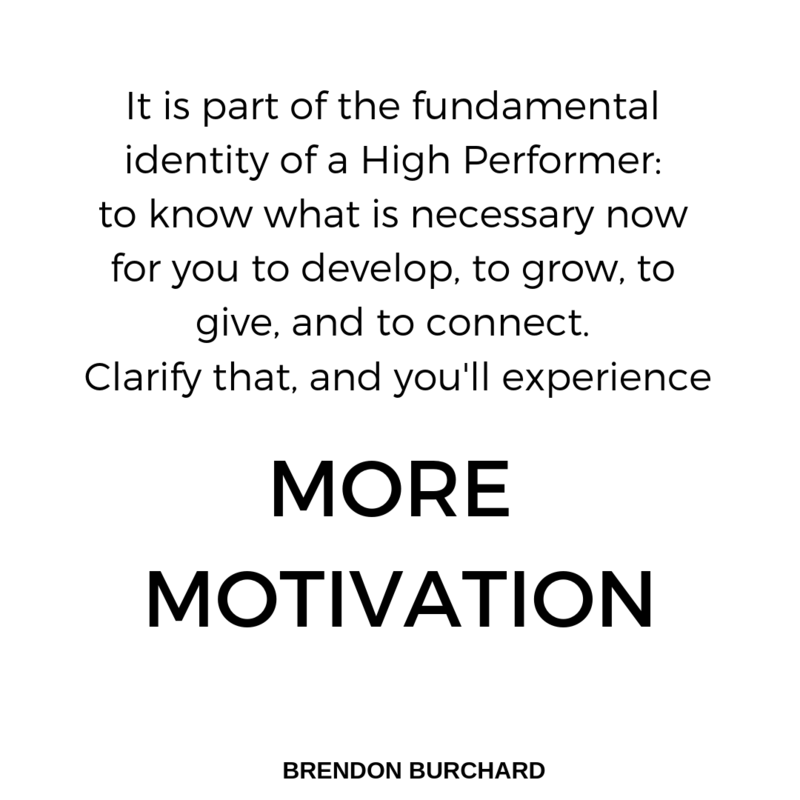 It is part of the fundamental identity of a High Performer: to know what is necessary now for you to develop, to grow, to give, and to connect. And if you have not clarified that, that is why you don’t have more motivation.